Every week UMFC will post a new chapter into the Books of Revelation for your review and understanding. If you have missed a chapter(s) just email me, letting me know what chapter's you've missed, and we will email them directly to you within 48 hours. "Dedicated To Preaching, Protecting, and Standing On Gods Word"
From: Minister Tony Franklin Sr.
"The Seventh Seal & The Seven Trumpets"
Last week we covered chapter 7 dealing with "protection of the saints" during Tribulation. I also went a little out of the way to explain the 3 commissions of the Holy Spirit. I hope you were blessed by it. We also fully explained the 144,000 remnant of Israel. This week JUDGMENT BEGINS! You might cringe, as we start our studies about the Seventh Seal theSeven Trumpets and the awful judgments and devastation's that are released upon the earth. Saints we have become a Biblical rebellious society; turning away from God and trying to remove him and Christ from our way. Now God has to judge mankind and the judgments are awful. But God is just! For, HE has not turned from us WE HAVE TURNED FROM HIM! In the opening of the Seventh Seal it introduces the seven angels and the seven trumpets. Remember that the number of seven (7) represents completion. At this point everything else is in the future. The things that shall be after these things. There are terrible and tremendous judgments continuing to come to this world. You have read nothing yet saints. The Trumpets are designed by God to bring us to the full intensity of Tribulation. The Seventh Seal tells us that God is judging directly and supernaturally a rebellious race of people that has turned from his word. In this chapter several things come to a climax with the number of completion (seven-7). Chapter 8 of the Books of Revelation is the chapter of Symbols. These symbols are the reality of what is coming upon mankind. Pay close attention to this chapter, and the rest of the chapters of the Books of Revelation- because the intensities of judgment begins. a. The Seven (7) Trumpets - Is the direct activity of God against man. b. The Seven (7) Personalities - Is judgment as a result of Satan's fight against God. c. The Seven (7) Bowls - Is the final judgment of God because of Satan and mans rebellion. Christ is now directing tribulation from Heaven. There was silence in Heaven for about a half hour. Saints this does not mean a literal "half and hour" for Gods time is not like out time. It literally means - a "pause of action." Christ orders a halt to everything. Nothing can move without his consent. It is the "LULL BEFORE THE STORM!" Christ gives mankind a chance to repent, but mankind will not repent of their ways and deeds and turn back to God. Mankind will explain off the Sixth Seal catastrophes (in chapter 6), as natural occurrences. Mankind will say it is only nature reacting out of natural causes, not of God's judgment. Saints, God has no pleasure placing judgment on mankind. He is slow to anger and to bring judgment. At this time he is waiting for world repentance. The golden censor is hurled upon the earth by the great Angel. The thundering voices and lightning's show that mankind can no longer blame things on natural occurrences for the voices and thundering definitely show God is in judgment and in control. Mankind shall hear the thunderings and voices from above. The earthquake is a result of the severe pressure placed upon the earth during the great tribulation period. Now is the time for the Trumpets to begin their sounds of judgment upon the earth - such as has never been seen before. Saints, now divine wrath is visited upon a rebellious mankind in great and awful ways (AMEN)! The first angel sounded his trumpet, and hail and fire mingled with blood were cast into the earth - and 1/3 parts of the trees and all the green grass were burned up. Every form of plant life is affected first. But this is only 1/3 parts of plants. Fire is the instrument God uses in this judgment upon the earth. Notice saints plant life was the first thing to be created in Genesis 1:11, now plant life is the first to be affected in judgment during tribulation. Notice also that these judgments sent upon the earth by the first angel are similar to the ones cast upon Egypt in Exodus 9:23, 24. When the second angel sounds his trumpet, the seas are the next things affected by the direct judgment of God. Some think this "great mountain" is a meteorite hitting the seas, but it actually is a great mountain volcano erupting, breaking off and sliding into the sea. And 1\3 part of the sea became as blood due to the great devastation and judgment upon the sea. 1\3 part of sea life was destroyed, and 1\3 of the ships on the sea were destroyed. These things (sea life and ships) were probably destroyed by a great huge mega tidal wave that will race across the seas bringing terrible destruction when the giant volcano mountain breaks off and slides into the ocean. This great mass of mountain is exactly the same as the one mentioned in Jeremiah 51:25 where God is talking about Babylon in the Book of Jeremiah. This appears to be a meteorite (out of heaven), which hits the earth containing poison, and affects the water in the rivers. This is a direct judgment upon man for injustice and idolatry. When you read scripture and see the word WORMWOOD, it usually proceeds as punishment of injustice, and/or idolatry. Calamity and sorrow are the compensation for mankind because of Gods judgments. God speaks of wormwood as a sign of judgment in several areas of the biblical text. Listed below are some of those scriptures for your review and understanding. There is something extremely important to remember saints! Man is extremely dependent on the sun as well as the moon and stars. They were set forth as a measure for separating the day from the night, and for the determination of seasons, and for managing the "water tides" of the earth. 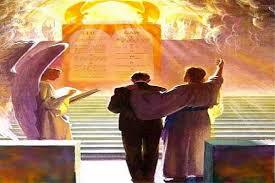 They were set forth during the fourth day of recreation by God and ordained for his purposes over the earth. Now, the LIGHTS ARE PUT OUT AND MANKIND IS CAST INTO UTTER DARKNESS. Jesus Christ also mentions these things will also happen in Matthew 24:29. Notice saints that these judgments and signs shall cause the greatest energy shortage and earthly disturbances that the world has ever seen, and will have devastating effects on all things that can and will take place on the earth (the seas, the land, the heavens, and above all MANKIND)! The announcement is made of an even more intensity in the judgment that is about to come into the earth because of the other three (3) trumpets that are about to blow. The announcement is woe, woe, and woe, (the 3 woes), to the inhabitants of the earth by reason of the other voices of the trumpets yet to sound. These last three plagues or judgments will directly discriminate between the righteous and the wicked just as in the judgments upon Egypt. These last "woes" are also about to bring great devastating torment upon mankind for their refusal to obey God and his word. Next week we will continue to finish this great section of the Books of Revelation and see what happens. I’m not gonna tell you – just tune in to the website next week. Saints Revelation is an intense study - and its getting more and more intense and frightful each chapter. Stay tuned for more!